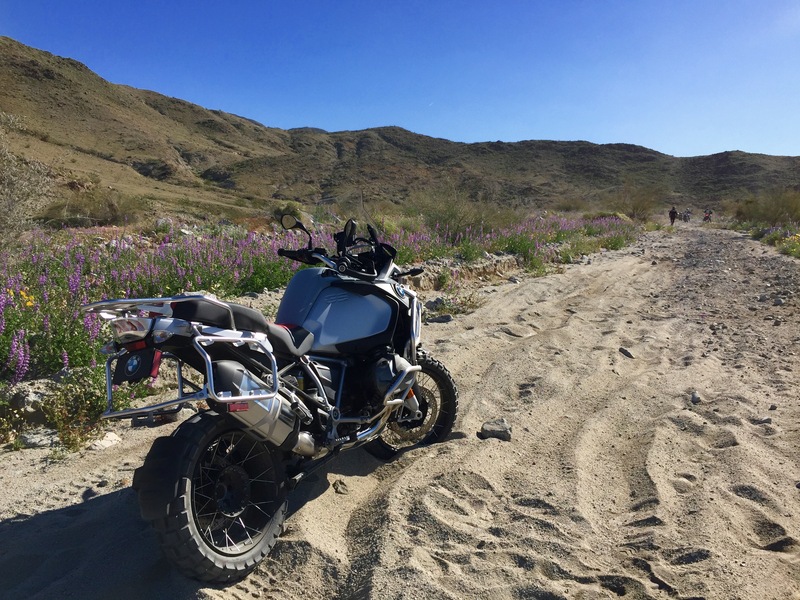 Well, the first patch of sand I tumped over in was more a result of surprise right after we’d turned down the dirt road a few miles outside of Palm Springs: How dare BMW leave this stuff here on a press introduction route? 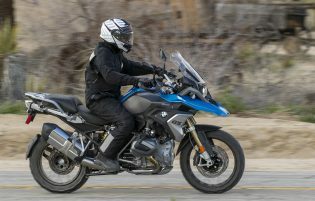 It was embarrassing but also a learning opportunity: Has the new R 1250 GS Adventure lost any weight? 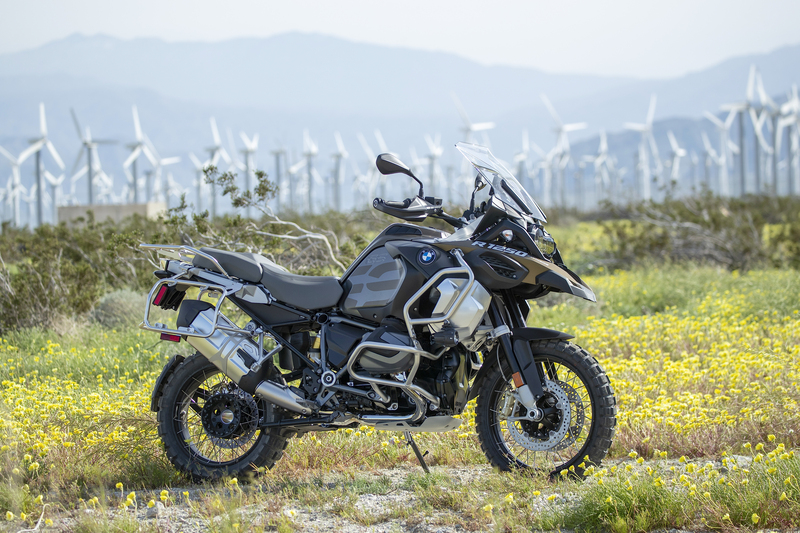 No, BMW’s specs say the new bike weighs 591 pounds fully fuelled to the R 1200 GS Adventure’s 573 lbs. Would I be able to pick it up by myself? Yes! I was able to upright the thing in the sand before hardly anyone spotted me. But I think it was sheer embarrassment adrenaline doing the lifting. Once we got rolling on some harder-packed Mojave, all was right with the world. After all the rain, the desert’s in bloom, the temperature is 62, and the big GS is the same awesome ship of the desert it’s been for quite some time now. 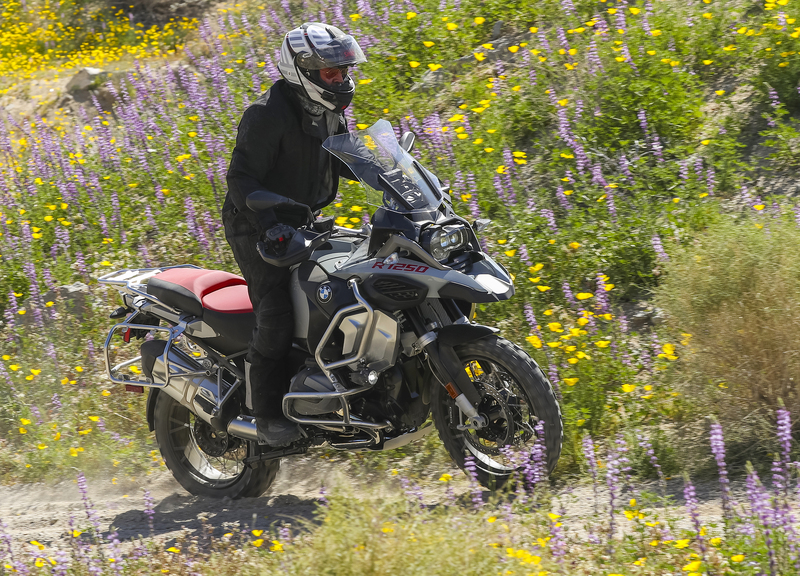 The excuse for the ride was the introduction of a host of upgrades to the 2019 GS/GS Adventure and R 1250 RT bikes – the biggest of which is the new 1250 Boxer engine now with Shift Cam variable valve-timing technology, for more power over a broader spread. Kalamata Metallic Matte with Exclusive Style Package, $500: Black and Grey Seat, Grey Frame, Gold Calipers, plus Premium Package: All yours for $23,895. 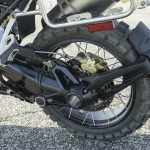 Our man Dennis wrote it up pretty extensively last September: “The new engine is BMW’s first application of VVT on a motorcycle… BMW’s iteration uses a single intake camshaft with two cams per valve with an actuator sliding the camshaft laterally to select which set of cams is in use. The smaller partial load cam imparts a reduced lift to the intake valves for improved fuel consumption and refinement at low revs. 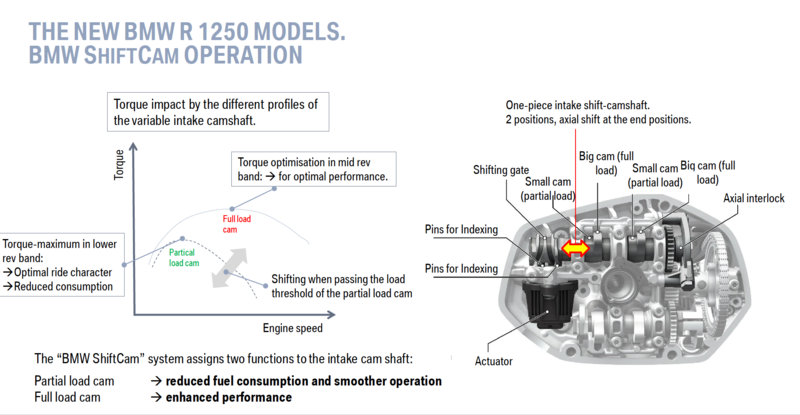 At higher engine speeds, the larger cams kick in, maximizing valve lift for optimal performance. 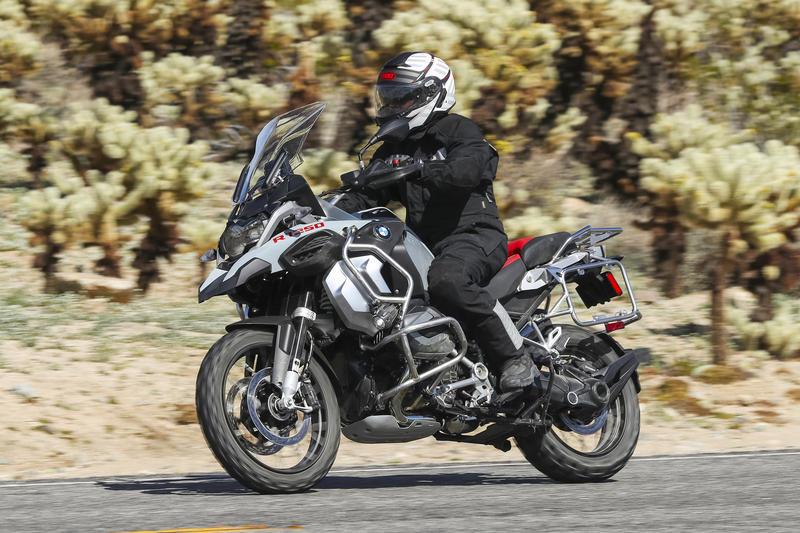 “The R1250 models are 84cc larger than the previous 1170cc engine on the R1200 bikes. The larger displacement was achieved by increasing the cylinder bore to 102.5 mm from 101 mm, and the stroke to 76 mm from 73 mm. 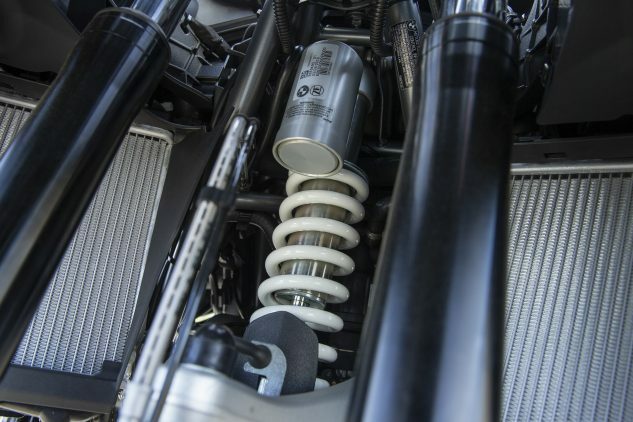 “BMW also introduced a slight phase shift to the intake valves so that they open to different degrees in a staggered order. This creates a swirl effect to air-fuel mixture for more efficient combustion. The R models continue to use a mix of air and liquid cooling with cooling fluid targeting the cylinder heads. 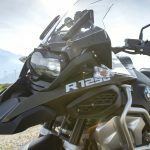 “According to BMW, these changes combined increase torque across the rev range topping out at a claimed 105.5 lb-ft at 6250 rpm (the previous engine claimed 92.2 lb-ft.). BMW also boasts an increase in power output, claiming 134 hp at 7750 rpm, compared to the R1200 engine’s claim of 123 hp. The changes also result in a 100-rpm reduction in idling engine speed, lower emissions levels, and, says BMW, optimized sound and 4% lower fuel consumption. 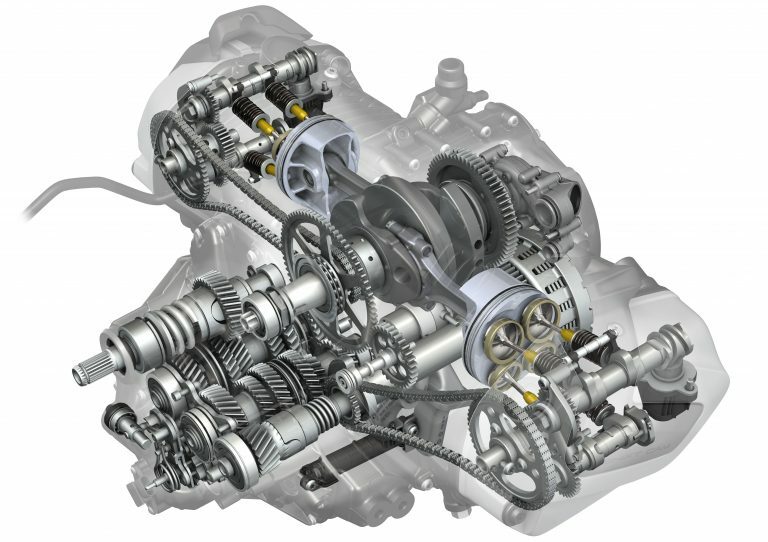 The new engine uses toothed chains instead of roller chains to rotate the camshafts. The chain for the left cylinder is connected to the crankshaft while the right cylinder’s chain is connected to the counterbalance shaft. Those claims from six months ago are same as the current ones, with the exception that BMW now says the new 1250 makes 136 horsepower (maybe our earlier 134 was a typo). I don’t think anybody really thought the 1200 needed more power, but since they had to make the Euro 5 changes anyway, the engineers just went all in. In short, power isn’t a problem, and controlling it isn’t either. From virtually any rpm above idle, you can whack the throttle open and be experiencing the full 7750-rpm monte very shortly thereafter; now power flows from the big boxer more freely and linearly than ever – and that’s saying something since the R1200 was no slouch. We were rolling nicely along for a few miles, till we came to a bend in the road, around which a few bikes had stopped for a break but not on purpose. More deep sand. Oh dear. Sand on big bikes like these is a confidence thing: If you can keep your momentum up, you plow right through. Slowing down is the wrong thing in spite of what your survival instinct tells you when your wheels start wandering every which way. But I had to stop `cuz the trail was blocked. 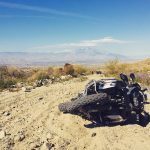 Once it was cleared, I remembered from Jimmy Lewis how to get started in deep sand: Just dump the clutch and lots of gas. My bike’s rear Continental TKC80 dug us right out but just as we were coming up on plane we musta hit a big rock submerged in the sand and thunk, over we went. Actually there is no sound when you fall in the sand at 7 mph other than a muffled “F*&K!” This time I waited for one of the strong young BMW bucks to come help me pick it up. At this point I was thoroughly warmed in my black Aerostich in the bright sun even though it was only 63 degrees according to the bike’s excellent new, currently vertical, TFT display. I dumped the clutch again and was squirreling along with just enough speed to hit second gear when something else subterranean threw the BMW sideways into the berm at the side of the road, and sent me flying onto a rock with an ooflahh. FAAAAAAAAHH!… I thought I’d maybe cracked a rib but I was okay. It’s a good thing my Aerostich suit lately fits me like an Ace bandage. While testing the Adventure’s crash bars and handguards, I wished my bike had the Parasol Package. Anyway, we finally made it through the 16-mile off-road section, but I wouldn’t have made it – nor quite a few of my compadres – without the aid of BMW’s experienced guides in a few – or was it four or five – 100-yard sections of deep shifting sand and rocks. 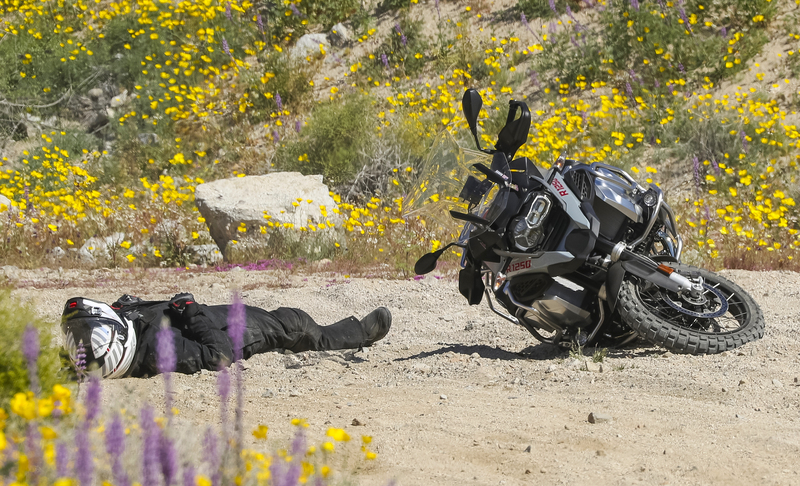 When we made it to lunch an hour late, I asked as a semi-joke, if BMW’s free roadside assistance program would come rescue you in a spot like that in the middle of the Mojave? The serious answer is yes, and they’re working on getting more tow truck operators outfitted with the right equipment to drag motorcycles onto their truck beds. 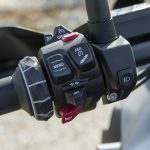 No cell reception is no problem; Garmin has a small unit that’ll Bluetooth to your cell phone and allow you to send text messages via GPS: “I need an Oxycodone, a flatbed truck and a bottle of chilled Chardonnay…” A few of the bikes needed new valve covers. Personally I think I could make do with the non-Adventure GS’s 5.3-gallon tank, slightly less wheel travel, less weight and lower seat. BMW says we’re getting 50 mgp now instead 47 for the 1200 – a remarkable and commendable 6% improvement. In addition to the bigger tank, the Adventure version of the bike gets crash bar protection as standard, wire-spoke wheels and 8.3 inches front/ 8.7 inches rear wheel travel instead of the standard GS’s 7.5/ 7.9 inches – and probably some other stuff I’m leaving out. 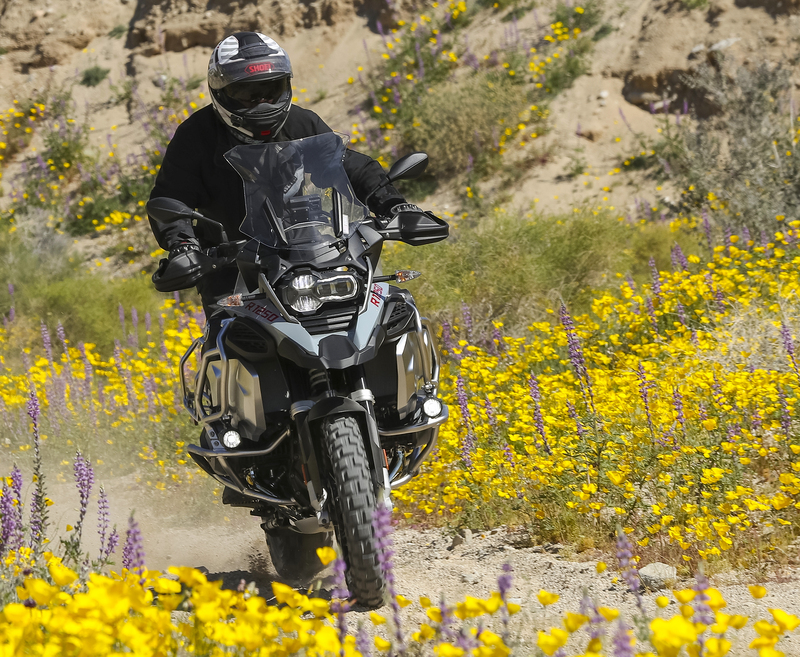 For both GS and GS Adventure, BMW offers up a bewildering array of option packages and optional equipment. I didn’t fully appreciate the GS’s 6.5-inch TFT display until I hopped onto an R1250RT later, with the previous dashboard. You’ll be able to make phone calls, order pizzas, listen to music and use this as a GPS among other things. From there it gets complicated. The base GS sells for $17,695, but you’ll be wanting to spring for the $3,050 Premium package, which in addition to Cruise Control, gets you: Next-Gen Dynamic ESA with Auto-Ride Height Adjustment and Auto Damper Settings, Gear Shift Assist, ProCross-Spoke Wheels (also available as a $500 option), Ride Modes Pro with Enduro, Enduro Pro, Dynamic and Dynamic Pro Modes, Hill Start Control Pro, Comfort Seat (also available as a $100 option), Dynamic Brake Control (a new thing that shuts the throttle for you when you’re panic braking!). Also about ten more things. 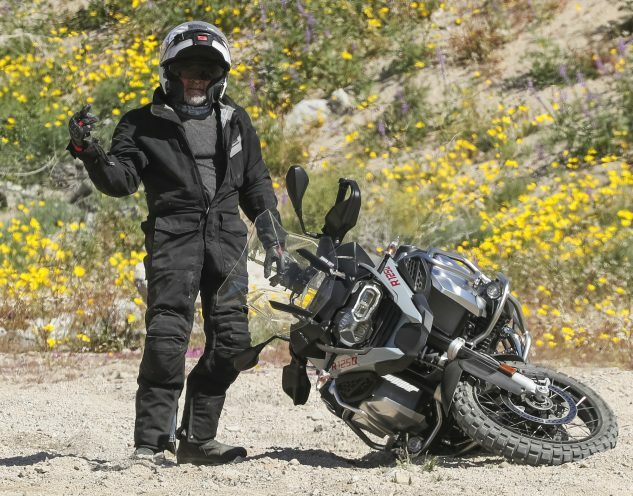 In addition to the packages, there are a bunch of options including a low or a high seat ($0), an aluminum fuel tank for the Adventure ($350, whose lightness doesn’t help much when you’re carrying 47 pounds of gas but whose polished panels look awesome), a suspension lowering kit ($250) – also some new Style packages including a very nice 719 Billet Pack that goes for $2700. You could have hours of fun bolting that stuff on in the custom man cave. We’re a premium brand, BMW admits. 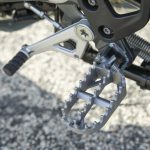 Standard base-bike electronics include simple Rain and Road modes, along with Auto Stability Control and Hill Start Control. Ride Modes Pro is also part of that Premium package, and contains a bunch of new electronic trickery. Now, in addition to Dynamic and Enduro, you’ve got Dynamic Pro and Enduro Pro available on the Mode button. 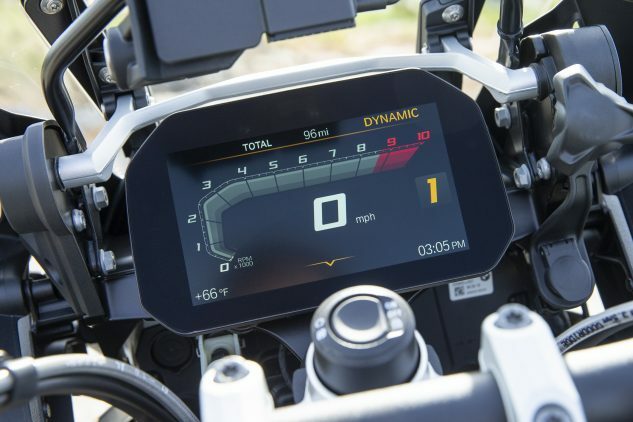 ASC morphs into DTC – Dynamic Traction Control – with lean angle detection that allows controlled slides. ABS becomes ABS Pro, which is BMW-speak for lean-sensitive ABS. Hill Start Control becomes HSC Pro, with automatic activation of the hold function. And don’t forget that new DBC – Dynamic Brake Control – which closes the throttle in case you forget to in a panic-braking situation. We’ve got swell new LED head and taillights. Basically, there’s everything you need to plow through any obstacle, we’re only lacking a Sand mode (Enduro Pro is close). In fact, I think it’s safe to say this motorcycle can go pretty much anywhere if the rider is capable. Sadly, it needs a better pilot than myself to find its limitations off-road. 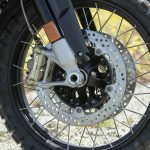 On-road, the big Adventure’s only going to be limited by the thrum induced by, and the short life of, the Continental TKC80 tires we opted for on our test unit (another $0 option). 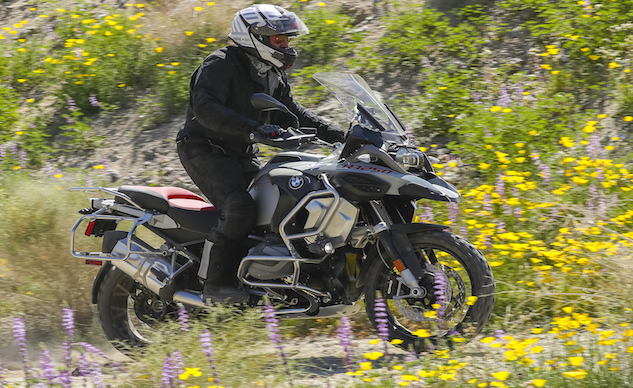 Aside from the little bit of vibes they send up through the chassis, there’s little not to like – and in fact the decrepit old 2018 R 1200 GS blew the other competitors out of the water in our 2018 Big-Bore Adventure Touring Shootout, and that’s before it got all the newfound power and other upgrades of this 1250. With cruise control set at 80 mph and 4500 rpm, the Boxer’s not even trying. With mode set to Road and that thick seat and swell suspension, it really is a magic carpet ride over nearly all paved surfaces and many non-paved ones – and if the 50 mpg claim proves correct, you’ll have to stop long before the motorcycle. The first BMW in 1923 was a boxer. 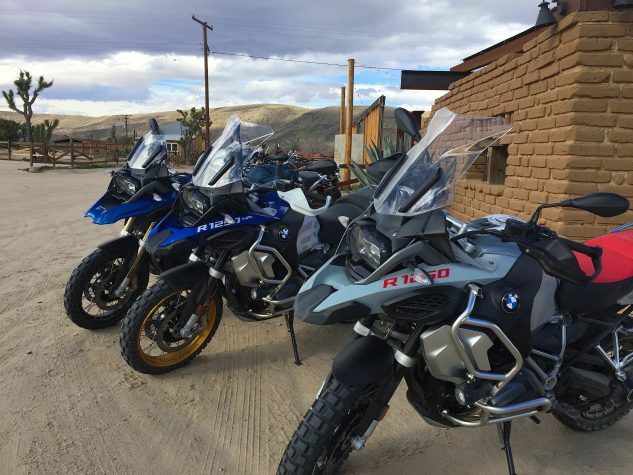 The first oilhead R1100 GS of 1993 was a huge hit that pulled BMW into modern times, and was also the first GS yours truly crashed (into the Animas River in 1994). 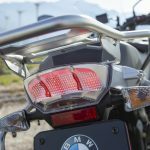 In 2018, over 50% of US BMW sales were also boxer models, with fully 27% of sales attributable to the R1200 GS – and that’s a trend BMW has no intention of abandoning any time soon. These things are simply the most highly evolved all-terrain motorcycles in the world, and if you can get one, you deserve it. We’ve put on a few more pounds, have’t we?